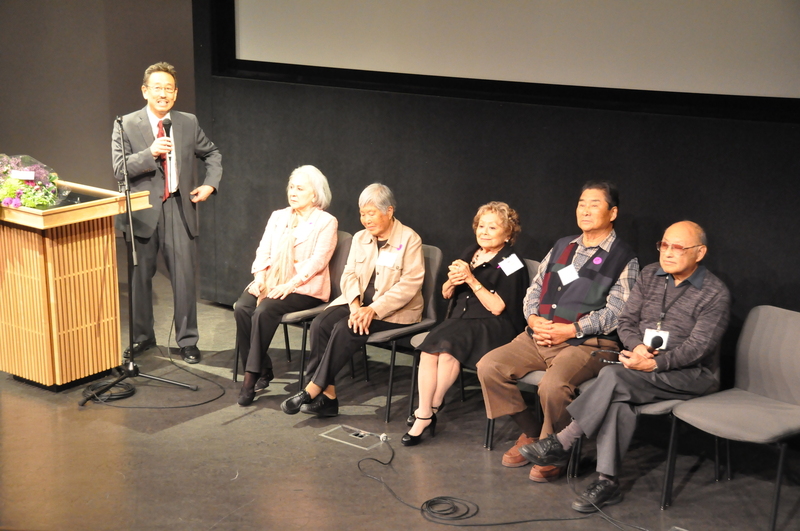 On November 2, 2013, JANM held a premiere film screening for the documentary, Unexpected Journeys: Remarkable Stories of Japanese in America in the Atsuhiko & Ina Goodwin Tateuchi Democracy Forum. Produced by the Museum’s Frank H. Watase Media Arts Center, and sponsored by NITTO TIRES U.S.A Inc., Unexpected Journeys is a 30-minute documentary of selected interviews of individuals whose lives illuminate the astonishing diversity of the Japanese experience in America. John Esaki, Director of JANM’s Frank H. Watase Media Arts Center leads a Q&A with the interviewees and the project’s videographers. Not only did guests get to watch the premiere public screening of Unexpected Journeys, they also got to enjoy a Q&A session led by director John Esaki with interviewees Sumi Hughes, Jean Schneider, Iris Teragawa, Harry Oda, and Lloyd Inui. The Q&A session continued with videographers Akira Boch and Evan Kodani joining the interviewees on stage. Guests chat with the documentary’s interviewees, sponsors, and staff over refreshments. After the public screening and the enlightening Q&A session, guests, interviewees and their families, project participants, staff, sponsors, and other special guests were able to greet each other over light refreshments. Among Saturday’s special guests, was Frank H. Watase, who JANM’s media arts center is named after! Check out these photos from the premiere public screening of Unexpected Journeys! Dr. Greg Kimura, JANM President/CEO, welcomes guests to the screening. Keiko Brockel, president of NITTO TIRE U.S.A. Inc., welcomes guests and gives an opening address. John Esaki, Director of JANM’s Frank H. Watase Media Arts Center speaks about the process and nature of the documentary. Jean Schneider answers a question while Sumi Hughes listens intently. Iris Teragawa adds her comments to a discussion started during the Q&A session. Lloyd Inui elaborates on a question raised during the Q&A session. JANM’s Media Arts Specialist Akira Boch and Media Arts Assistant Evan Kodani join the interviewees on stage for the Q&A session. Lloyd Inui greets guests attending the public screening. Guests enjoy refreshments after the public screening. Thank you John Esaki, Akira Boch, and Evan Kodani, for all of the time and energy you put into this project! For the past year and a half, JANM’s Frank H. Watase Media Arts Center has captured more than 25 first-person accounts of individuals whose lives illuminate the astonishing diversity of the Japanese experience in America. With the support of NITTO TIRES U.S.A. Inc. and its visionary President, Tomo Mizutani, the Watase Media Arts Center staff has been enabled to videotape extensive interviews with Nisei, Japanese-speaking Kibei, Hapa, and post-WWII “Shin Issei.” Their stories have revealed many new historical insights and several previously unexpressed personal perspectives on the World War II era and beyond. From the little known early Yamato colony of Japanese in Florida where Sumi (Fukushima) Hughes’ parents settled to the challenges faced by Hamako (Amano) Schneider, one of the first Japanese war brides to be admitted to the U.S. following World War II, the project has uncovered many aspects of history that have remained unfamiliar to the public. Photographed in Hi-Definition video by the Media Arts Center’s videographers Akira Boch and Evan Kodani, each interview is transcribed, translated when necessary, and digitally archived for eventual use in documentaries, exhibitions, and ongoing JANM educational projects such as the Discover Nikkei website and the Museum’s YouTube channel, janmdotorg. The project also involved follow ups with interviewees and their families to gather, identify, and scan photo albums, documents, and other supplementary resource material. After viewing the completed two-to-three hour interviews and assessing the available supplementary photographs and other visuals, the Media Arts staff—with assistance from Japanese staff member Yoko Nishimura of the Discover Nikkei project—edited selected interviews into a 30-minute documentary, Unexpected Journeys, that interweaves short autobiographical profiles with narration, graphics, and music by accomplished composer and musician, Dave Iwataki. To make these stories accessible to as wide an audience as possible the video includes both English and Japanese narration and subtitling to reach both English and Japanese-speaking audiences. On Saturday, November 2, several of the interviewees and their families will attend a special premiere public screening presented in JANM’s Atsuhiko and Ina Goodwin Tateuchi Democracy Forum and will be able to meet fellow project participants, staff, sponsors, and other special guests. Light refreshments to follow program. 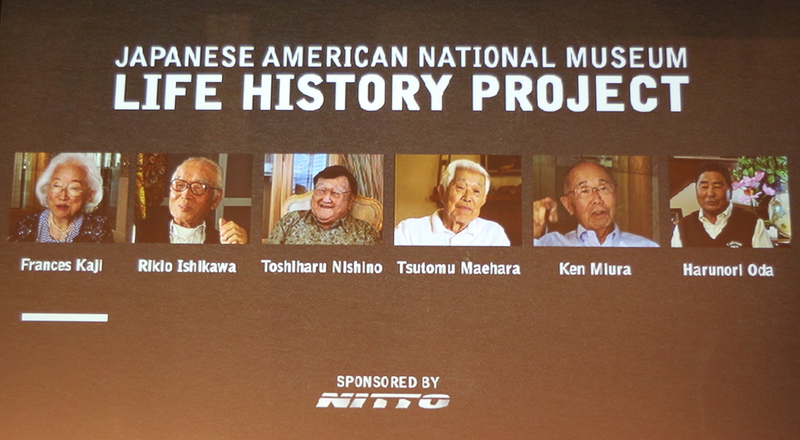 This program is sponsored by Nitto Tire and produced by the National Museum’s Frank H. Watase Media Arts Center. Drop by the Museum this Saturday, June 22nd at 2pm for court-side—or rather, screen-side—seats to Hapa Hoops! We will be showing the documentary Crossover followed by a conversation with hapa NBA veteran Rex Walters. The program is free with admission to the Museum. Produced originally for the More Than a Game exhibition (2000) by the Museum’s Watase Media Arts Center, and directed by Justin Lin (of the Fast and Furious series), Crossover is a fast-paced look at the history and purpose of Japanese American basketball leagues over the years. First established in the 1930s as an opportunity for Japanese Americans to participate in competitive sports, the leagues have flourished over the years—bringing about questions of how to adapt to an increasingly diverse player base. Walters got his basketball start playing in one such youth league. Before making his professional debut with the New Jersey Nets, he helped lead the University of Kansas Jayhawks to the Final Four in 1993. He currently works as head basketball coach at the University of San Francisco. This program is presented in conjunction with our exhibition Visible & Invisible: A Hapa Japanese American History, running through August 25th. Visible & Invisible explores the diverse experiences and history of mixed-roots and mixed-race Japanese Americans through photos, historical artifacts, and interactive elements. As I near the end of the 10 weeks here at the Museum, I revisited the job description out of curiosity – how accurately did the description match what actually transpired? 1) Videography and editing of public programs that feature world-renowned scholars, artists, musicians and community activists. Public Programs by Dr. Cherstin M. Lyon and Dr. Diane C. Fujino? Scholars. Check. Interviews with Ako Castuera, Sean Chao, and Rob Sato? Artists. Check. Public Program by Anabel Stenzel and Isabel Stenzel Byrnes and combing through Gidra footage with Mike Murase and Evelyn Yoshimura for Discover Nikkei? Community Activists. Check. 2) Research, production assistance and transcription of life history interviews with notable Japanese Americans. Interviews with Justice Kathryn Doi Todd, Director Jimmy Murakami and Professor Lloyd Inui? Check. 3) Design and implementation of motion graphic elements for short video productions that will be broadcast on local television and featured on the Museum’s websites. Making a public service announcement video for the Japanese American Olympics on August 11th from 11 AM – 5 PM? Check. 4) In addition to receiving training for the specific duties and responsibilities of the internship, the Museum’s volunteer docents will introduce the intern to the history and work culture of the National Museum as well as the history of Americans of Japanese ancestry. Japanese American History Classes, tour of Common Ground, and Little Tokyo Walking Tour? Check. The only thing not listed above: Time Traveling. One of my greatest joys of being here at the Museum has been sitting in on the Life History Interviews. This past week, John Esaki, Akira Boch, and Chris Aihara and I had the opportunity to interview Professor Lloyd Inui [Professor Emeritus at CSULB in the Department of Asian and Asian American Studies and a senior adviser at the Japanese American National Museum]. In a way, each of the Life History Interviews is but a single time capsule that saves and preserves one’s individual experiences up until that moment in video form. Over the course of about 3 hours, we traveled from before 1930 to the present day as Lloyd told stories of his childhood, incarceration, post-war employment, time in the military service and the beginnings of Asian and Asian American Studies at CSULB. Not only was it was amazing to hear eyewitness experiences of the effects of war and living through the incarceration camps, it was impoartant to realize how the major that will be written on my diploma next year was formed – through struggle, perseverance and a desire for remembrance, a passion for critical thinking, as well as progression forward. Lloyd’s vivid recollections of warfare, the meetings of some of the first Asian American Studies classes, and perspective into his journey to the present day were truly insightful, stark and honest – treasures that I hope future generations will learn from and appreciate. Each person has a story to tell. Lloyd’s unique experiences, the seemingly insignificant details, every friendship he formed over the years, added to the person he is today and the ideas that he calls his own. It’s striking to realize that someday, maybe in the far future, the next generation will be asking us to tell our life story. What histories are being written right now? What is your story only you can tell? Jenni Nakamura is one of three Getty Multicultural Intern working within the Watase Media Arts Center, a senior studying Asian American Studies at UCLA with an interest in culturally relevant social services and the social networks of Asian American churches, and a passion to explore the use of visual arts to preserve and give light to hidden personal histories and community issues. Greetings! My name is Jenni Nakamura. I am one of three Getty Multicultural Undergraduate Interns, here at the Japanese American National Museum, working in the Media Arts Center. Over the next 10 weeks, I will be shooting, editing, transcribing and learning as much as I can from John Esaki and Akira Boch (and the rest of the National Museum staff!). I am a 4th year Asian American Studies major at UCLA. My interests are culturally relevant social services within the Asian American community and my passion is to explore the use of visual arts to preserve and give light to hidden personal histories and community issues. It is an immense blessing and gift to be a part of the family here for the summer! Though seemingly fragmented, these pieces form an intricately woven puzzle that have led me to this moment. To be sitting here in the Media Arts Center, is like a complete picture: media, Japanese American history, stories of the past, and Little Tokyo. I’m amazed and thankful for all that has transpired to be here, now – just another part of a continuing journey – destination to be determined. Thankful and excited for these upcoming weeks, for the stories to be heard, the lives that will intersect and the hope that comes from reflecting on the struggle our community has endured. Drawing the Line videos all online! There’s just one more month to see Drawing the Line: Japanese American Art, Design & Activism at JANM! If you’d like a taste of what is in the exhibition, all of the Drawing the Line artist videos are online now. You can check them out on our YouTube channel. Here’s the video of musician and dancer Nobuko Miyamoto, founder of Great Leap. Nobuko Miyamoto—What Can a Song Do? Los Angeles Contemporary Exhibitions, 6522 Hollywood Boulevard, Los Angeles, 90028. Together with a group of guest musicians and activists from the 1960s/‘70s and the present, Miyamoto brings alive the dynamic moment when her 1973 album “A Grain of Sand: Music for the Struggle of Asians in America,” created a heartbeat for the Asian American Movement and shared rhythms with Black, Latino, and Native American cultural and political activists. General admission is $10, students is $5, and it’s FREE for members of JANM and LACE! Tickets available at the door. Visitors to the museum often remark that what made their experience so special was getting to hear and talk to our volunteer docents. They share stories with our visitors that bring the artifacts in our Common Ground: The Heart of Community to life. An ongoing project at the museum has been for our staff & interns in the Watase Media Arts Center, curatorial, and education units to work with some of our volunteers to develop 30 second (approximately) short videos talking about their favorite artifacts from Common Ground. The project is part of an ongoing effort to examine and re-envision the role the Museum and our volunteers will play in the 21st Century. 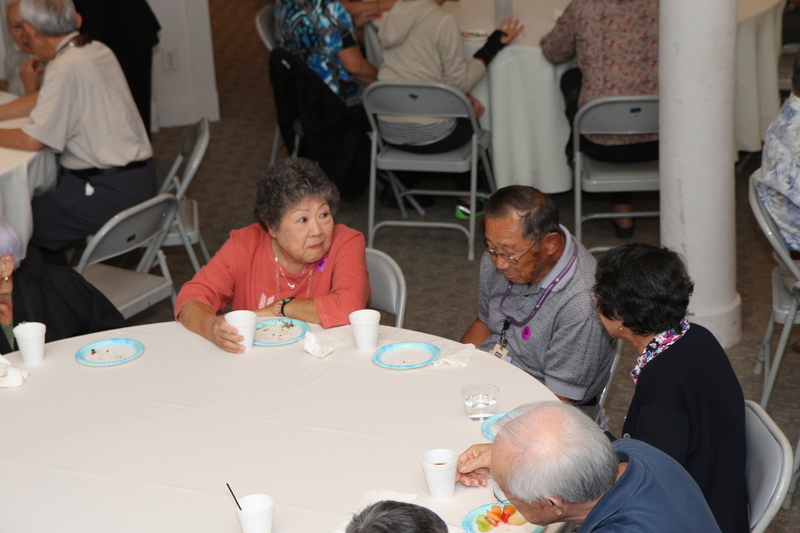 This is a wonderful project to record and share the stories especially of some of our older long-time Nisei volunteers while they’re still active at the museum. We’re now up to 25 volunteer videos online. The most common artifact selected is the Heart Mountain barracks which makes an appearance in 3 videos. Although most are World War II-related, several are about pre-war Issei and Nisei life. While many are very poignant, some are humorous, like Marion Wada’s selection of a Hershey’s chocolate tin which recalls fond memories of childhood prior to WWII. For those connected with the museum or have gone on tours here, you’ll recognize a lot of very familiar and dear faces. I’ve included a few of the more recent videos here, but you can view all of the videos from our Discover Nikkei website or on YouTube. Which ones are your favorites? We’d like to thank the participating volunteers for sharing their personal stories: Ike Hatchimonji, Charlene Takahashi, Icy Hasama, Marion Wada, Mary Karatsu, Hitoshi Sameshima, Bill Shishima, Nancee Iketani, Ben Tonooka, Pat Ishida, Bob Uragami, Babe Karasawa, Yae Aihara, Richard Murakami, Yoko Horimoto, Jim Tanaka, Tohru Isobe, Mas Yamashita, Robert Moriguchi, Kathryn Madara, Kent Hori, May Porter, Eileen Sakamoto, Lee Hayashi, and Roy Sakamoto. 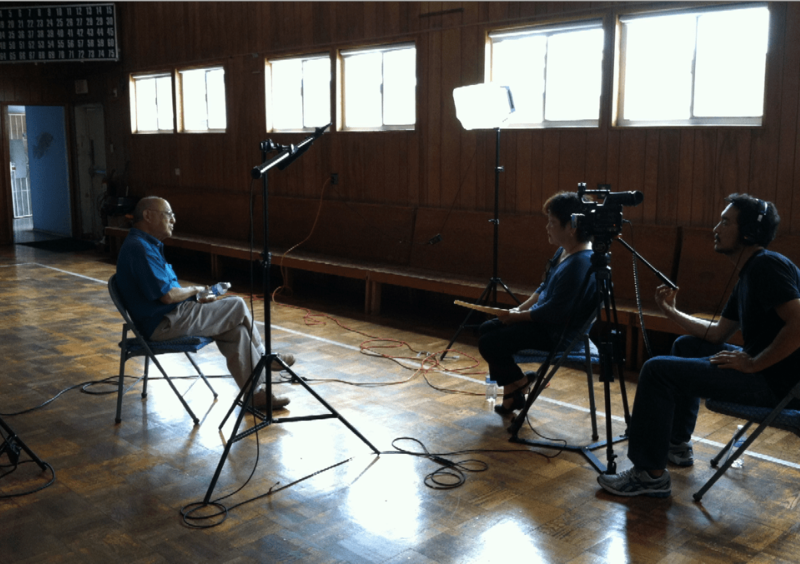 Funding for the Nisei Oral History project was provided by grants from the National Park Service and the California State Library through the California Civil Liberties Public Education Program. When you walk into the museum now, one of the first things you notice as you enter the front doors to the Pavilion is a 1963 Corvette Sting Ray. I pass by the car every day on the way to my office, and I always see visitors stopping to admire it. But why a Corvette in the Japanese American National Museum? It’s because it was designed by Japanese American automotive designer Larry Shinoda, and it’s part of the Drawing the Line: Japanese American Art, Design & Activism exhibition on view through February 19, 2012. Untitled drawing (Stingray), Larry Shinoda. Pencil on paper. Gift of the Shinoda Family, Japanese American National Museum (2003.124.3). Upstairs in the exhibition galleries, we also have a number of his original drawings and sketches of various other cars he designed like the Mako Shark concept car, and the Boss Mustang. There’s also a bunch of historic photos, trophies, and other memorabilia that were donated to the museum by his family after his passing in 1997. I have to admit that I don’t know much about cars, but the aerodynamic sporty style is very cool to see, and his personal story is very interesting too. His father died when he was a young child. From early on, he was always interested in cars and in drawing. He and his family were incarcerated at Manzanar during WWII. After the war, he grew up in Southern California where he built and raced cars, leading to his work designing and building cars. By the way…Shinoda didn’t just design cars. He also worked on pretty much anything that moves such as Roger Penske’s race trailers, motor homes, tractors, big rig trucks, and even the Goodyear Blimp logo. And for those who were wondering…no, he’s not related to the other famous Shinoda that we have featured at the museum! One more bit of trivia…the wedding dress currently on display in our Common Ground exhibition was made by Larry Shinoda’s mother! Our award-winning Watase Media Arts Center recently produced ten new videos for the Drawing the Line: Japanese American Art, Design & Activism exhibition (on view through February 19, 2012). For those who can’t make it down to see the exhibition or prefer to watch it from the comfort of your own home, we will be sharing them online over the next few months. The first video up is about Gidra, the seminal magazine of the Asian American movement published from April 1969 to April 1974. We’ll be posting new videos weekly. So check back for the links. We’re pulling them together into a Drawing the Line playlist on our JANM YouTube channel too. Drawing the Line opening tonight! The opening celebration for Drawing the Line: Japanese American Art, Design & Activism in Post-War Los Angeles is just a couple of hours away! Join us tonight from 5:30 to 8pm to celebrate the opening members, many of the artists and their families & friends, and special guests. There’ll be a special performance by Nobuko Miyamoto with Benny Yee & Atomic Nancy! Our staff & volunteers have been working hard to get the show ready to open. Along with the artwork & artifacts, our Watase Media Arts Center has developed new video segments about each of the featured artists. You’ll be able to view them in the exhibition, but will also be available for sale on a DVD through the Museum Store. There’s also a Guide by Cell audio guide with audio clips from the interview. Check out the updated exhibition site for more info on the Guide by Cell, to see the bios for the featured artists, plus links to full scans from 4 issues of Gidra magazine on Discover Nikkei! There’s also more exhibition-related public programs added (more to come! ).